Sorry for the lack of updates and charts. Catching up with work after a 10 day vacation has taken longer than expected. Short 350 shares of HAL at $34.63. Short 350 shares of YHOO at $27.10. Long 300 shares IR at $37.10. 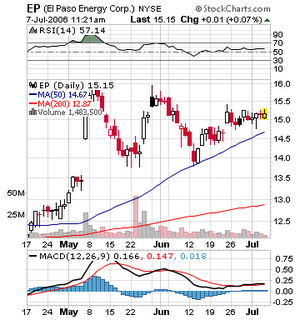 I sold 400 shares of VLO at $67.50 for $880 gain. Florida Rock (FRK) looks ripe for a short on an up move towards resistance. 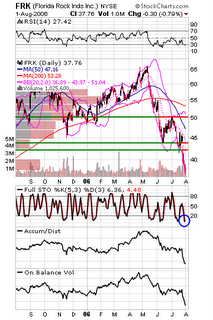 I would wait for the stock to move out of oversold territory and price to approach the gap area of $42-45. The stock could get this needed bounce if the Fed decides to halt interest hikes next meeting. 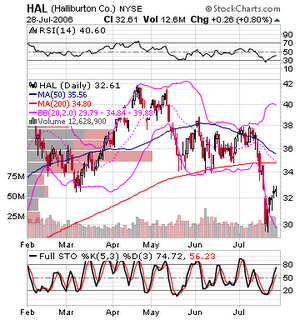 HAL: Haliburton looks like a perfect "short the rally of a stock in a downtrend" play. 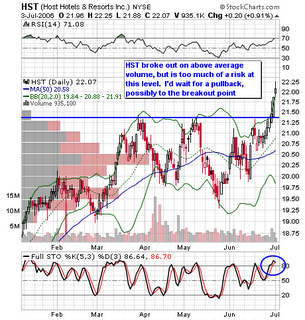 I would get ready to short if the Stochastic hits 80 and the stock shows weakness at the 34-35 resistance area. HAL also looks ready to hit RSI resistance at 50-60. 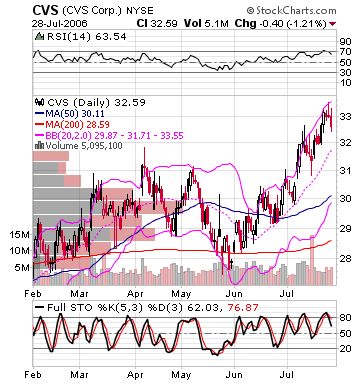 CVS: CVS corp has been on fire since early June and recently broke over resistance. I would wait for a pullback to the mid-Bollinger Band for entry. 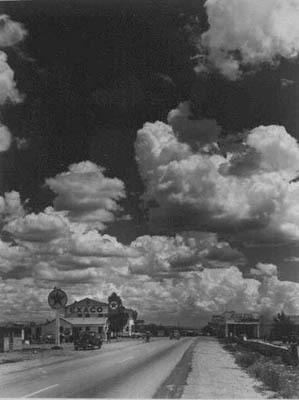 I'm back from a wonderful cross country road trip and ready to get back in the swing of things. I made a few successful trades last week which I'll detail soon. As I get caught up with work, the market and home, I may fall behind detailing my trades. However, I plan to post at least two new charts daily, starting tomorrow. I'm leaving for vacation tomorrow morning and, unfortunately, will not be able to post until July 24th or 25th. 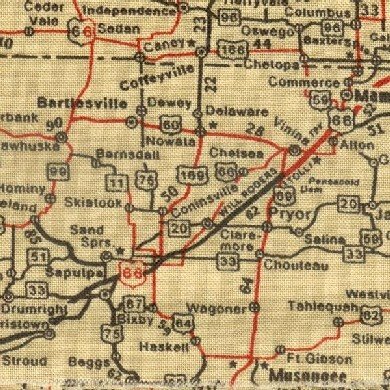 My wife, baby daughter and I will be driving cross country for a week and a half. Should be quite an adventure. I hope to have some pics when I get back. Wyclef Jean's "If I Was President"
Does This Market Make Any Sense? What's Up With Oil Stocks? The reaction of oil related stocks to the new highs being made in crude oil has me scratching my head. USO, XLE, VLO, HAL and XOM all closed down or only slightly up today. Due to this discrepency, I'll be watching my VLO position very closely and will be ready to bail on signs of weakness. The stock should have done better than it did today. 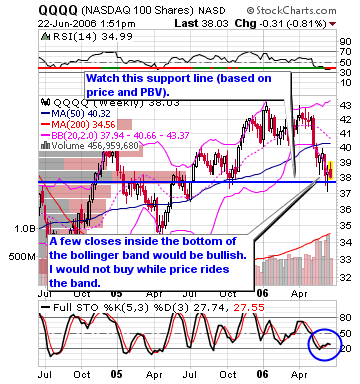 VLO (Valero) has been one of my favorite oil plays. 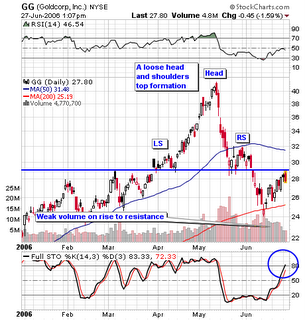 I bought 400 shares at $65.02 The stock broke out of a "double bottom" pattern on strong volume and has held support. I have a stop placed at $63.90, and would likely sell into resistance in the $69-70 range. 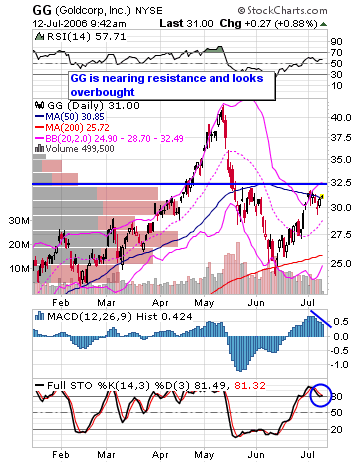 I also sold half of my 500 shares of GG at $29.86 for a $307 gain. For the remaining 250 shares, I've moved my stop to the "break even point." 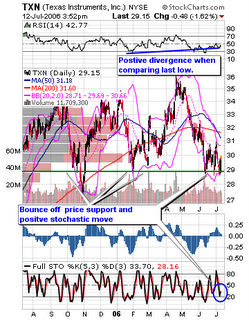 I sold all of my 500 share position in TXN at 28.95 for a $140 loss. A small bet that didn't pay off. After the move in semis yesterday, I kept a close watch on the industry today and decided to make a small bet on TXN (Texas Instruments). I bought 150 shares at $29.23. 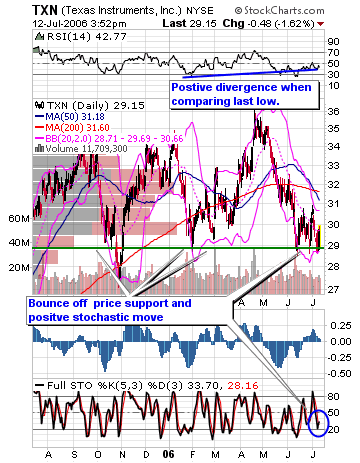 Three technical indications also piqued my interest in TXN: a positive divergence in RSI, bounce off oversold condition in stochastic, and bounce off 29, which has provided strong support over the past year. 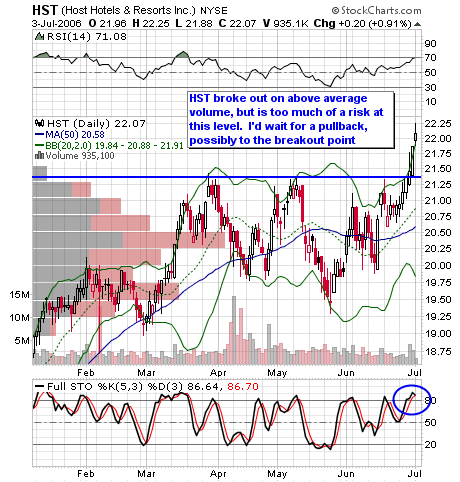 The one time 29 did not hold, the stock bounced back rather quickly. I went short 500 shares GG at an average cost of $31.15, with a stop at $32.60. The latest up move seems to be a minor retracement prior to another leg down. However, a break of $32.50 could signal a challenge of old highs. 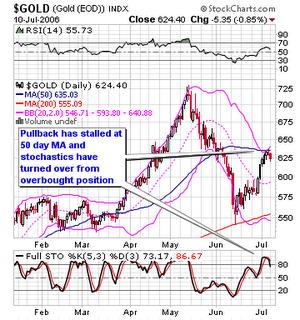 Gold has set itself up for an excellent short play. 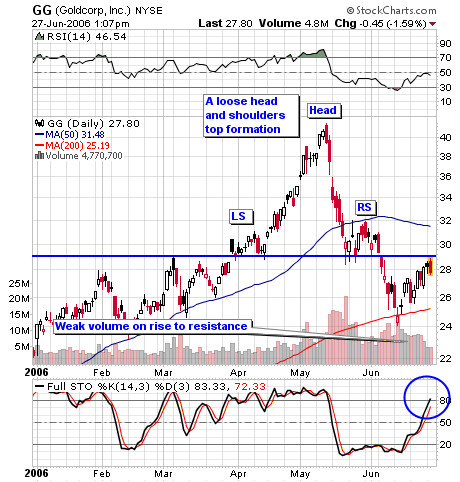 The commodity has stalled at the 50 day MA, is overbought and looks to be on a downward descent until it becomes oversold. If conditions look good tomorrow, I'll be making some big short plays in gold stocks. 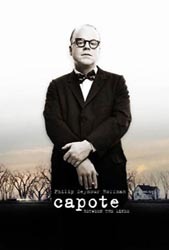 By the end of the movie, it becomes painfully obvious that Capote is torchered by the fact that he had hoped his literary subjects would be denied their appeal and quickly executed, just so he could have an ending to his book. He went so far as to sabotage their appeal by not finding a lawyer to argue on their behalf. The men lose their appeal and are killed by hanging. Capote goes on to write one of the greatest non-fiction pieces of the 20th century, but his life is forever altered. Getting back to the trading, do you ever feel guilty when you make money off of someone else's misery? It becomes easy to ignore this fact when your sitting in front of your computer watching numbers on the screen, but there is no denying the market is a zero-sum game [update: apparently there is more debate than I originally thought]. Your winning means another person has lost. And we're not just talking about lost pride after a friendly game of chess. Fortunes are won and lost in the market. One man's buying a brand spankin' new beemer after a good day in the market, while another has to sell his home. Does that make you feel guilty? Should Jesse Livermore have felt some sense of dispair after shorting the market and making a killing off the '27 crash, while many market participants could not even feed their families? My answer is no, I don't feel guilty and I certainly won't be shedding any tears over my good fortune. We all know the rules and accept the risks. However, every time I am lucky enough to notch another win on my belt, I do wonder what's happening on the other side of the trade. While their are many variations and names for this transitional setup, Dave Landry does a good job of explaining what he calls the Bow Ties strategy. The market might be headed for a short term uptrend (possibly within a longer term bear market), so this strategy could come in handy for when looking for good reversal setups. Click here and turn your speakers on. I bought 500 shares of EP at $15.10. 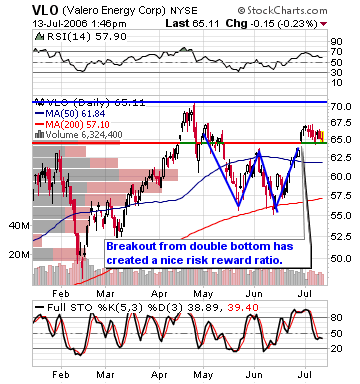 The stock is in the midst of a "coiled spring" pattern and looks poised for a breakout. Stop placement is just under the 50 day moving average, at about $14.50. With resistance looming at 16, that makes for close to a 1:2 risk/reward. If the stock does reach 16, I'll sell half my shares and let the rest ride, moving my stop on the remaining 250 shares to the purchase price. 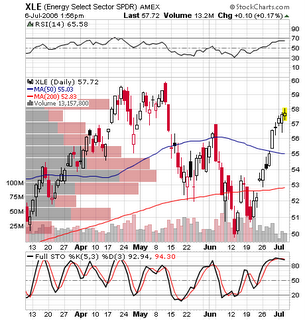 The Energy ETF XLE looks interesting. The stock has reached an extremely oversold stochastic level and it moving into PBV resistance (the grey/red bars on the left of the chart). It is very possible that the stock will take a breather here before mounting a serious challenge to break out over these highs. I might make a quick, low risk play here, going short with an extremely tight stop set at $58.30. If the stock does not pullback, or pulls back and again challenges this level, I will become bullish once the stock clears $60. 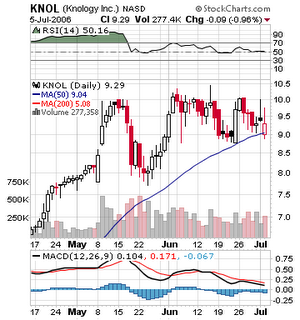 If you like to play bounces off of moving averages, KNOL (Knology) has a nice setup. I would enter now and place a stop 15 to 25 cents below the 50 day MA. This makes for a low risk, high reward setup. ATHR (Atheros Communications) gapped down below both price and moving average resistance, making for a great short candidate. 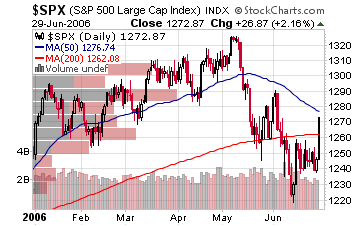 I would wait for a retest of the 200 day MA. If the stock can't jump over the moving average, it's time to put your plunger cap on. 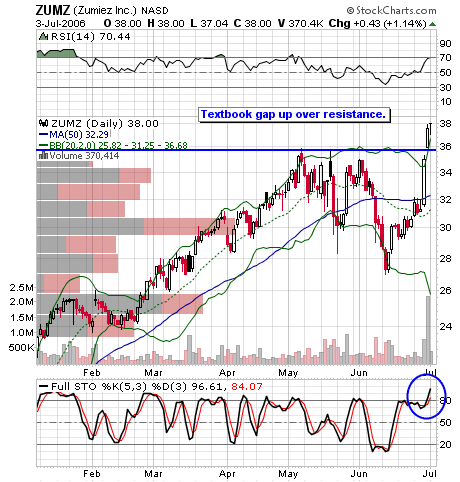 HST and ZUMZ both have broke out over resistance levels on strong volume. I would wait for pullbacks before entering either stock. I bought 500 shares of PSPT at an average cost of $13.35. This is currently my only position, as I am waiting to see if this bull move is a blip on the bearish radar or a true move towards new highs. I used my own tweaked version of Alan Farley's "Dip Trip" method for this entry. Basically, it's a play on the correction of a stock that has been acting strong. Once PSPT spiked off it's resistance point I jumped in. I expect it will at least hit it's $14.50 high and may climb futher. I'll sell half my shares if it reaches the high and move my stop up to 14 for the remaining position. My current stop is just below the 13 resistance level. If the stock moves under 13, the dip trip play is invalidated, and it may even be time to reverse and go short. The S&P 500 index cleared one hurdle by crossing over the 200 day MA and is now butting up against the 50 day MA. Right now I'm hesitant to go long, but a cross of the 50 day would be a green light for me. I decided to clear out my entire portfolio, both long and short, in anticipation of the fed meeting today. I'm on vacation but I do have a laptop with wireless internet through Verizon. I will try to update yesterday's trades later tonight. This c hart shows why I shorted Goldcorp (GG). I went short 400 shares GG at $28.67. 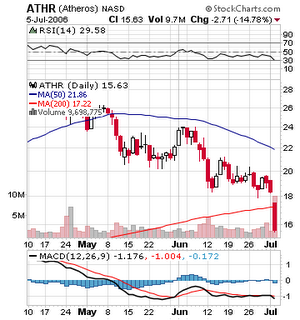 I sent short 300 shares of PHM at an average cost of $29.10. 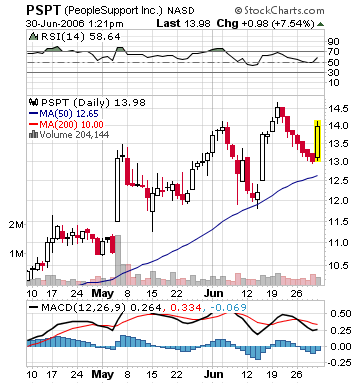 I bought 300 shares of PSPT at an average cost of $13.25. 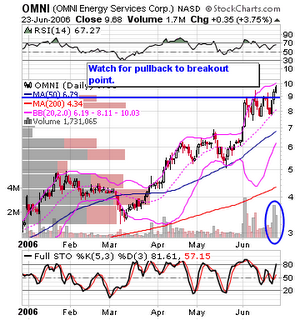 I've added the following stocks to my watchlist: CELG, OII, AVA, FTD and HMSY. I am also considering shorting PHM and GG and going long PSPT. 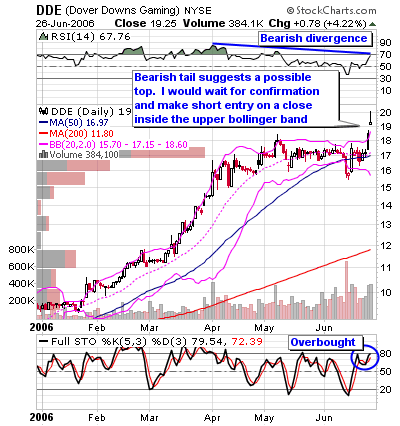 DDE has the makings of a good short setup. However, be careful with this stock. It has held strong in a weak market, so I would only enter upon confirmation that price is leveling off. A close inside the upper bollinger band with a stop outside the band or last price bar would minimize the risk. I sold 300 share of KNOL at an average cost of $10.01 for a $301 gain. $10 has acted as both a price and round number resistance point over the past two months. If it breaks out over this point on strong volume and to new highs, I will likely re-enter. Note that price movement and volume could change these to long setups rather quickly. 2. Don't try to pick bottoms in a correction or bear market! 3. Even when you know you are right, wait for confirmation. Once I have completed my review, at the end of June, I will show examples of trades I made that violated these stock trading maxims. 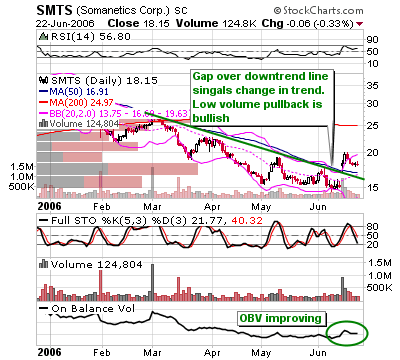 The recent gap up could start a new trend in SMTS. The Q's (Nasdaq 100) are at a major support area. A break of the support line would be a signal to short, while a move up off the line would be bullish. I won't try to guess this one, but once I get confirmation I may make a play in my longer term account, as I think a move in either direction could be the start or continuation of a longer trend. 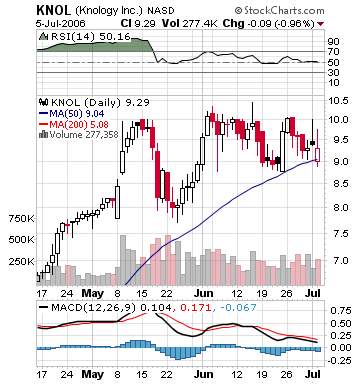 I took a small position in Knology (KNOL) at $8.95. I don't want to get too aggressive with any longs considering my take on the market. 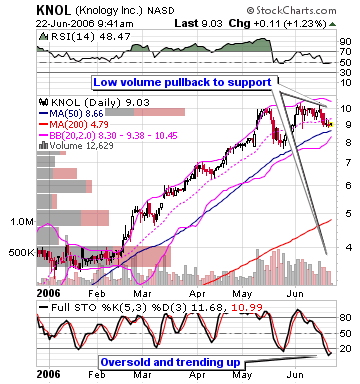 KNOL has pulled back to support on low volume with oversold stochastics that are trending up. Also note that the stock has been under above average accumulation since it's gap up in early May.